Prepare to get your mind-blown and your consciousness expanded! It’s your chance to own a bit of Bongo history, with the first two exclusive psychedelic black light “Futurama” posters. 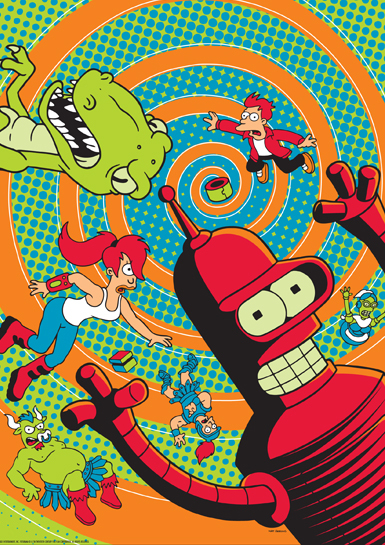 To celebrate fifty fantastic issues of Futurama Comics, Bongo begins a yearlong promotion featuring six bimonthly posters. One will be folded into every copy of Futurama Comics #50-55. Get caught in a time-travelin’ vortex or fight off a many-tentacled thing with the whole Planet Express crew. These beautiful black light prints are signed, rolled in tubes, and available only at the Bongo booth (#2519)!